Oh my! These Vegan Cauliflower Tots came out so good! I have seen lots of recipes for cauliflower tots on the internet. However, all of them call for cheese. Well I figured out how to make these vegan cauliflower tots dairy free. These are a super cinch to make and they taste awesome when dipped in my homemade ketchup. 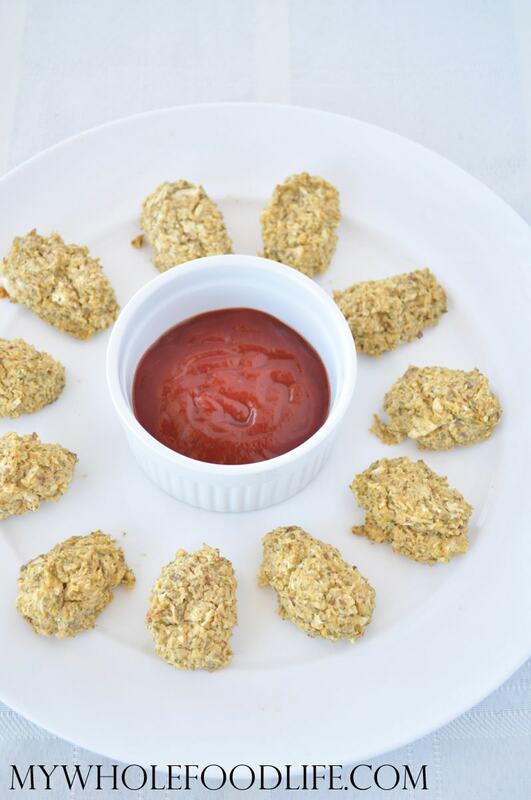 This recipe was inspired by my cheesy vegan quinoa bites. I thought if I could get quinoa to bind, then why not cauliflower too? You definitely need to try this kid friendly recipe! I used panko bread crumbs to make mine, but you can also use gluten free breadcrumbs to keep them gluten free. I think that would work fine. I hope you enjoy these vegan cauliflower tots as much as we did! I think these would be great served with a salad or some roasted veggies. An easy, kid friendly recipe! Pulse the cauliflower florets in a food processor until it is in small pieces. Mix all ingredients in a bowl . Next, fashion little tots on a baking sheet and space evenly. Cook for 20-30 minutes or until they look a golden brown. Serve right away or let them cool completely before removing and transferring to a container. These should last at least a week in the fridge and you can probably freeze them for longer. Enjoy! I made these last night and they were sooo good! I altered mine by adding fresh chopped oregano & rosemary, curry powder to the batter. I've been making my own cashew cheese for a couple years and I make each batch slightly different. To this one I added red onion, garlic & one dried cayenne. Hubby really enjoyed these. Definitely will be a repeater. I made my own ketchup but also made it very different from yours & it turned out awesome! I'm not a ketchup fan so I had to doctor mine up. Thanks for the unspiration! So glad you liked the recipe Kelly! My son has egg, nut and dairy allergies. Do these hold together without the Almond cheese? You might try sweet potatoes instead. To clarify - baked and mashed sweet potatoes. You could also try puréed chickpeas. Could I use coconut cheese?